The European sprat is a kind of fish. 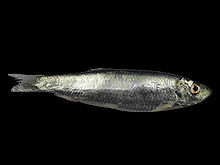 It is related to the herring. It lives in the ocean, all around Europe. It has about 12% fat in its flesh. It is a source of many vitamins. It is an important fish for commercial fishing, and can be found in many cans in shops. It can also be salted, to preserve it better. This page was last changed on 17 March 2016, at 03:07.